Personalized genomics may be moving into a new era with whole-exome and whole-genome sequencing becoming affordable and available to consumers. 23andMe recently piloted a more affordable 80x exome to their existing customers. But it remains to be seen whether this wealth of raw genomic data can be analyzed to provide meaningful results for both healthy and symptomatic individuals. 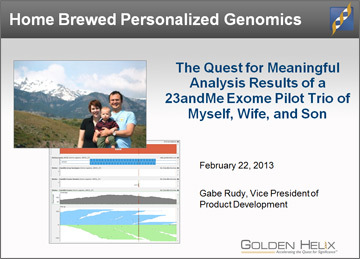 By acquiring 23andMe exomes on his family, Gabe puts himself in the position of a bioinformatically inclined consumer, but non-clinician, to approach this question with his own analysis. His trio consists of a healthy father and son, and a mother with clinically-diagnosed idiopathic rheumatoid arthritis. The following goals were set for the analysis: 1) How accurate are variant calls from direct-to-consumer NGS services? 2) How useful and durable is the list of risk variants provided by 23andMe? 3) Can a healthy individual's exome provide additional risk information over standard genotype-array-based risk prediction? and 4) Can the state of our current understanding of the complex genomic architecture of autoimmune diseases be enough to to find potential driver variants and genes to explain the diagnosis of a single case? Here Gabe presents his findings of this analysis and discuss how individualized genomics might change in the world of affordable sequencing.